Mr. Friedman also served on numerous national, state and local boards and commissions having been appointed by President Bill Clinton and California Governors Gray Davis, Jerry Brown and Ronald Regan. Among his many positions, Mr. Friedman served on the California State Air Resources Board from 1999 to 2004 and on the White House Conference on Small Business Commission from 1993 to 1996. He was the president of the California State Board of Education from 1982 to 1984, and he served as the president, vice president and director of the Del Mar Fair Board between 1982 and 1986. Professionally, aside from teaching, Mr. Friedman began his career as a deputy attorney general for the state of California from 1956 to 1958. 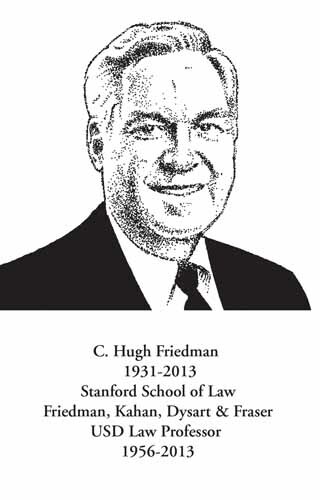 From there, he served as corporate counsel for Westgate-California Corp. from 1958 to 1971 and then as senior partner at Friedman, Kahan, Dysart & Fraser from 1971 to 1977. Mr. Friedman was part of the group that handled negotiations with Major League Baseball for the San Diego Padres expansion team in the late 1960s. He also served as a board member for the team through the John Moores ownership period. A graduate of Yale University and Stanford Law School, Mr. Friedman grew up in the San Francisco Bay area and was a talented clarinet and saxophone player, having played gigs with Benny Goodman and Artie Shaw. In addition to serving as president and director of the San Diego County Bar Association, he served on the board of the San Diego County Bar Foundation from 2005 to 2011, and was actively involved in selecting and inducting numerous honorees into the Distinguished Lawyer Memorial, which he chaired from 2007 - 2011.